Edinburgh Council advises that the carriageway on Queen Street (between Albyn Place and Hanover Street) will be resurfaced later this month as part of an investment in Edinburgh’s roads and footways for 2018/2019. This carriageway has been prioritised because of its current condition. The work is scheduled to start on the 22nd Octoberand should take approximately 4 weeks to complete. 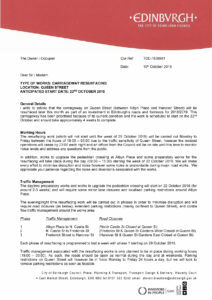 The resurfacing work (which will not start until the week of 29 October 2018) will be carried out Monday to Friday between the hours of 19:00 – 03:00due to the traffic sensitivity of Queen Street. However the noisiest operations will cease by 23:00 each night and an officer from the Council will be on site until this time to monitor noise levels and address any questions from the public. In addition, works to upgrade the pedestrian crossing at Albyn Place and some preparatory works for the resurfacing will take place during the day (09:30 – 15:30) starting the week of 22 October 2018. Following on from the previous post, there is a survey on Edinburgh Council’s consultation hub.